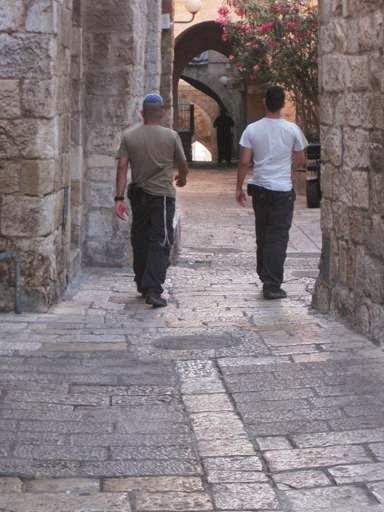 At first glance, you see two young Jewish men walking down one of the Rova’s (Jewish Quarter, Jerusalem) many interesting streets. One of them is wearing a yarmulke (head cover) and tzitzis (Biblical fringes), while the other one is not. There is a religious Jewish man wearing a long black coat in front of them. Now, look closer. The two young men have something bulging on their hip… loaded pistols. They are guards who walk the children, who live in the arab areas of the Old City, home. They also walk around our neighborhood keeping it peaceful. Thank G-d, with G-d’s help, they do a good job.